UK - OILC-RMT let the side down big style!! Yep.. as per the title is is very apparent that the OILC branch of the RMT, and the RMT leadership in London, have no interest in stepping out of their cosy little world and actually organising anything offshore. You can forget any initiatives coming out of the OILC/RMT that may be of help to the Offshore/ROV industry. They keep talking about self organising and yet despite a large recent boost in members, a new branch forum to help keep all members in touch (Note: The branch had nothing to do with setting up and running the forum as it was set up/run by a couple of proactive members). The OILC branch and RMT offshore regional organiser pretty much shunned the forum and added very little by way of keeping the members advised on what (if anything) was going on. The members were most certainly better connected than they had ever been in the history of the OILC, but as far as the branch were concerned nothing had changed. It also became apparent that the branch had major issues internally... I was even abused in an email by branch chairman for asking too many questions and also suggesting that all was not well. I have the email on record. The RMT ballot department screwed up the recent SS7 referendum ballot by dropping about 50% (of the names identified as eligible to be balloted, by the then OILC branch secretary) off the list. Why? Nobody will say. They were asked often enough but failed to give any reason. The Offshore Grades Conference in Aberdeen held last month was a washout in the words of one RMT organiser. 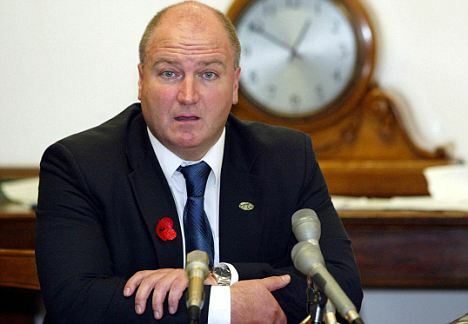 Even Bob Crow was a day late and day two of the so called two day conference didn't happen! Is the union funded well enough to be able to help the offshore industry? The OILC branch alone has something like 3500 North Sea members * £16/month * 12 months = £672,000 per year. Yep well over half a million quid! That doesn't count numerous offshore members scattered around the country in other branches adding their 16quids in the pot each month! It seems that the bulk of it is getting sucked up by the RMT to look after railway staff. You can now knock some members off the above figure because I am aware of a few that have backed out of the RMT now. I'm sure there will be more to follow. Can the OILC branch organise the North Sea? Nope. One branch cannot organise what might potentially be up to 26,000 North Sea members. The OILC branch needs the power and resources of the RMT to pull that feat off. So if the branch can't physically do it, and the RMT don't want to, then it's game over in my book. Have I changed my tune? Yes! Most certainly. In fact, based on my recent experience, a complete 'U' turn is more like it. Remember I was a diver and I fully supported the divers agreement. I'm sure here there are some that might say... 'I told you so'. But then what do they actually know about the internal workings of the OILC branch and the RMT to be able to back up that statement? There are some that will generalise and say 'unions do no good and ruin everything'... yet actors, football players, teachers and many other professions form unions. The Norwegian and Oz unions appear to have kept rates and conditions way up there for their offshore members. Higher rates and better conditions in our game will not bleed the oil companies dry... we all know that. The UK divers have benefited, very nicely thank you, from an agreement for years. One RMT organiser stood out for me like a bright beacon over the months. He is a person that can only give the union a good name in my book. The (then) OILC branch secretary Neil Rothnie. He was batting on our side from day one. In the end he was squeezed out because of his proactive nature and resigned under pressure from the branch. We gave it our best shot. The OILC/RMT pissed all over us and yet the so called leaders still slept soundly at night. So basically. Bugger them I say. The OILC will get no further support from me or this website however should anybody wish to post anything about unions, this board will remain open for them to do so as it is a general (global) union board and not an RMT dedicated board. James, be wary if anyone wants to take you fishing for the illusive "concrete boot fish". Can't say I'm entirely surprised. My own dealings with them 7 years ago about mirror what you've experienced. They should relabel it the 'railways union' and be done with it. I had hoped for a change with the OILC involved. Doesn't sound like that happened. I'd be interested to know if anyone is currently in Nautilus, the officers union, and if they've seen any assistance from them. They had an article in a recent copy of their paper stating they'd managed to secure 4% pay rise per year for the next two years for Saipem UK members. Anyone heard anything about that? I was in the pub. A classy post if I ever read one. I know you and other's put a lot of time and effort into trying to get people to join that union and put a lot of your personal and professional reputation on the line. Its rather refreshing to hear someone come out and say we tried it, this is why we didn't like it and give all the details possible. I'm sorry to hear about Neil. Though I didn't agree with most of his post's he came across as honest, sincere and definetely passionate about getting people to sign up. If they would sand bag someone like that, and then harass you for asking questions, I too would have jumped ship! Oh well ........... Cancel union fees ! Spewed it meesel last week. Another £16.20 better off, I'll treat it as a pay rise! I haven't been so disgusted since the EETPU of the 80's. And that's really saying summit. Non of this suprises me.....especially about the SS7 vote fiasco...Unions only look after their bosses too. Thanks for the comments. I just wanted to get it out into the open to ensure people know where ROVworld now stands with regards to the OILC/RMT. Whilst I am aware that some unions have achieved the objectives (to a large extent) of their members, but I'm equally aware that, in it's present form and under current management, the OILC/RMT will never come anywhere near organising the offshore sector. Over the last two years year they had large influx of subsea members and yet the organisers did bugger all, other than complain about how hard life was for them. I stand by the one exception, and that was Neil Rothnie whom is no longer with the OILC branch but is still an RMT organiser. Lets face it.. they (OILC/RMT) couldn't even organise their own Offshore Grades Conference properly this year, nor a simple referendum ballot (SS7) without screwing them up. I would love someone to come on here and attempt to deny that, but the chances of that happening are pretty low too. Can't want more than that. Now that we have effectively moved away from a union only willing to feed the fat-cats purses, let us now work on something IMHO much more constructive and owned by us only - the IROVA. Great expose'. Hang draw & quarter him! What a worthless wop. It's akin to the treatment we get from the major players in the O&G industry. Militant union baron Bob Crow has brushed aside calls for wage restraint – and quietly pocketed an astonishing 12 per cent pay rise. The hardline general secretary of the Rail Maritime and Transport union has taken the £10,000 salary increase, despite the painful pay freeze affecting millions of workers in both the public and private sectors. His basic pay rose from £84,923 in 2008 to £94,747 at the end of last year, according to figures published by the RMT. And his overall pay package rose from £122,167 to £133,183 last year. On top of this he claimed £9,989 in expenses and £2,376 in travel costs, taking his total income to £145,548.